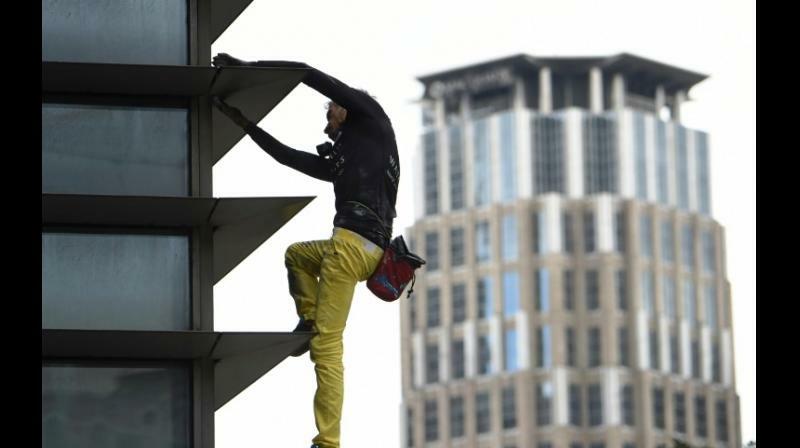 Manila: French urban free climber Alain Robert was arrested on Tuesday, police said, after he scaled one of Manila's tallest towers in his latest high-risk ascent. The 56-year old adventurer dubbed the "French Spider-Man" climbed the 47-storey GT Tower without safety equipment, leaving watchers on the ground staring in amazement. "This is my path, this is my way of living. It is as important to me as eating, sleeping. I need that. It keeps me alive," he told reporters after completing the climb. The police were less enthusiastic about the stunt and took him into custody as soon as he reached the ground after the roughly two-hour climb up and down the building. He was being held on a charge of public disturbance and was awaiting a decision from prosecutors on bail. Robert has scaled more than 100 structures without ropes or other safety equipment, setting a record for "most buildings climbed unassisted" according to Guinness World Records. His successes include many of the world's tallest skyscrapers and iconic buildings, such as the Eiffel Tower, the Sydney Opera House, Petronas Twin Towers in Kuala Lumpur and the Burj Khalifa in Dubai – where he used suction devices and a safety rope as it has no hand or footholds.